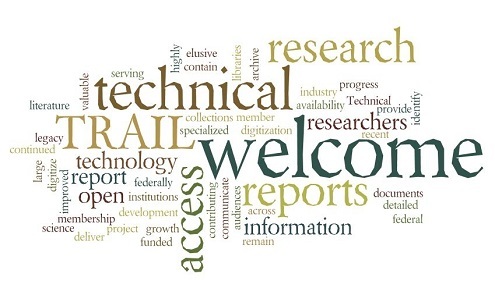 The Technical Report Archive & Image Library (TRAIL) identifies, acquires, catalogs, digitizes and provides unrestricted access to U.S. government agency technical reports. TRAIL currently consists of over four dozen member institutions whose annual membership fees and volunteered staff time further the efforts of the project. The mission of TRAIL is to ensure preservation, discoverability, and persistent open access to government technical publications regardless of form or format. TRAIL provides unrestricted access to these digitized technical reports through the TRAIL Search Interface. Millions of pages of elusive technical reports are now discoverable, thanks to the collaborative effort of TRAIL members. "TRAIL is a wonderful digital library." "Thank you so much for your help. The 25 year old copy of the monograph that I have was destroyed by water; finding it online makes me very happy! Please pass on my great appreciation to all those who have put together this very valuable service." "I can't begin to express the gratitude and research potential your site has provided to us. Thanks to TRAIL, I am able to find and download Bureau of Mines Bulletins pertaining to my area that the Bureau of Mines and Office of Surface Mining in PA don't even have in their libraries. Your site has made my research efforts a lot easier, saving weeks of time and travel expense." Technical reports communicate research progress in technology and science; they deliver information for technical development to industry and research institutions contributing to the continued growth of science and technology. These highly detailed reports contain valuable information serving specialized audiences of researchers.